I’m in the enviable position of having a blog with a wide readership (thank you) which means I get sent review copies by publishers. Everyone at work gets jealous when a book package arrives and I feel like a rock star. This is a good feeling. On the other hand, there are only so many hours in the day I can devote to reading these books. I have a lot of reading to just to keep up to date with my field, not to mention the ‘non academic’ stuff. Last month one of the committees I sit on had 135 pages in the agenda pack. As the blog has grown in popularity, publishers have sent books in at an increasing rate. I give some to students to review, but it’s hard to convince people to devote the time and the task falls to me. As a consequence I have started to accumulate a TBR (to be read) Pile of Guilt on my desk. The Guilt was based on more than getting a very handsome, obviously expensive, hardback with a lovely green cover in the mail. Martin has been kind enough to write for The Whisperer so choosing a reviewer was tricky. There might be a perception of a conflict of interest (which is essentially the same thing as actually having a conflict of interest). I thought about giving the book to a student to review, but, to be honest, it’s not a book that’s really designed for you. Each chapter seemed to suggest ways to help candidates develop that most difficult of all doctoral skills: critical thinking. We don’t bother devoting a lot of time to develop critical thinking at the doctoral level because we assume you already have that ability, which is a shame because it’s an interesting topic. I used to run an online course about critical and creative thinking at my last employer and had great conversations with PhD students from all around Australia. What is critical thinking, really? The book has loads of ideas. Sometimes I would open the book and read the table of contents, wistfully dreaming of a time I could read the whole thing from cover to cover. However, after months and months, I had to regretfully concede that this was a plan I could action only if I was actually retired (I have a lot of retirement fantasies about finally reading every book on my shelf, I’m sure you can all relate). Since I have no plans of actually retiring soon, I decided to focus my review on a close reading of only one chapter “Conditions for criticality in Doctoral Education: a creative concern”, by Eva Brodin, because it is the chapter most closely concerned with the theme of this blog. No wonder everyone is confused, right? Brodin goes on to sketch links between critical and creative thinking, starting with Brookfield (1987)* who positions critical thinking as a reflexive process where people critically examine “habitual actions, values, beliefs and moral codes” in order to “liberate themselves from uncongenial ways of living” (don’t you love the use of ‘uncongenial’ in that sentence? I feel like I am in a Jane Austen novel… That’s a compliment by the way). She goes on to quote Barnett (1997)**, who makes the claim that critical thinking involves “the creation of imaginary alternatives”. Brodin uses the term “critical creativity” to try to capture the relationship between critical thinking and creative thinking. I imagine that I have probably lost a few readers by this point, but try to stay with me because there’s an important point coming up I promise. Is critical thinking just about thinking though? This is where Brodin brings in Hannah Arendt’s theory of labour. According to Arendt, labour is “an endless process of drudgery, which is necessary for survival”. Brodin gives the example of housework, which I think is highly appropriate for describing a lot of what academic work looks like. It’s endless, the results (a clean sink, a dust free surface) are never stable, fixed, done – even when you retire it seems. As Pat Thomson put it, the writing work is never done: there’s always another paper, then another, then another. According to Brodin’s reading of Arendt, the value of the work has come to be located in the process, not the product. This might explain why academia seems so obsessed with metrics. Measuring academic output has become an end in itself, a game that you are constantly forced to play if you want to be considered a ‘real academic’. It used to be that being a ‘real academic’ involved publishing in the ‘best’ journals, appearing at ‘the best’ conferences. A lot of my colleagues hold on to this idea of what an academic is, but nothing stays the same, even in academia. When I started blogging (almost exactly 6 years ago according to my first ever post), it felt like liberation. 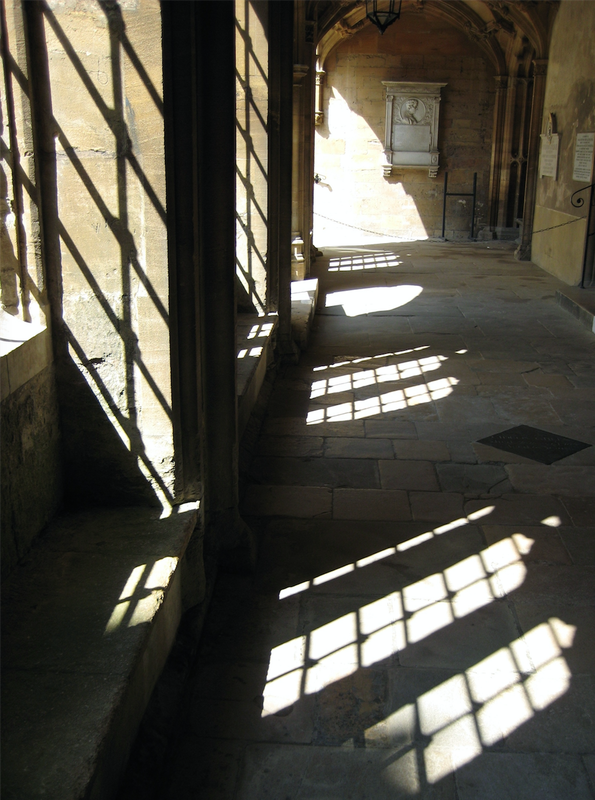 A space where I could give voice to my thoughts outside academic journals with their stilted language and lack of appreciation for Star Wars references. But the rise of the ‘impact agenda’ and altmetrics in the UK and my recent experience with applying for a promotion, using the blog as the main pillar of my argument for evidence of peer esteem, has made me question all that. Having an academic blog that people actually read is no longer just edgy-cool, it’s a legitimate career asset. Blogging, as I said to a friend the other day, is the new black. I used to think that when blogs start to ‘count’, that a victory of sorts would be achieved. Now I’m not so sure. Maybe the definition of academic work is just getting broader. This can be good and bad. As Pat pointed out in a Skype conversation not so long ago, we can be screwed by alt metrics as easily as by conventional metrics. Academics are under real pressure to start blogging as yet another way to make their work ‘count’. If publishing is the route to legitimising oneself as an academic, of becoming ‘real’, one of the biggest challenges for any PhD student today is how to position themselves as a public writer. Publishing in ‘the best’ journals is, still, a conventional expectation, but what about blogging? Should you do it? Pat and I are doing research based on 280 odd responses to our questionnaire on PhD student blogging last year. I’ve been coding the data in Dedoose and the overwhelming impression I get is ambivalence. Many respondents were enthusiastic and committed to the practice of blogging of course, but almost all of them had reservations about the value of it. These reservations seem to cluster around how they appear to others. Will they be seen as ‘unscholarly’, a ‘show pony’, a ‘time waster’? In her chapter, Brodin notes that similar fears plague thesis writers who, seek the safety of known formulas for writing a thesis for fear of being judged as ‘not real scholars’. What Brodin is encouraging us to do throughout this chapter is to develop what she calls a ‘questioning approach’ to the work of being an academic. Well, mission accomplished Eva! I’m impressed by you Palgrave handbook of critical thinking in higher education. So, should you buy this book? I do endorse books and products on the blog, but none of my posts are infomercials (as one commenter suggested in response to my recent post about Omnifocus!). 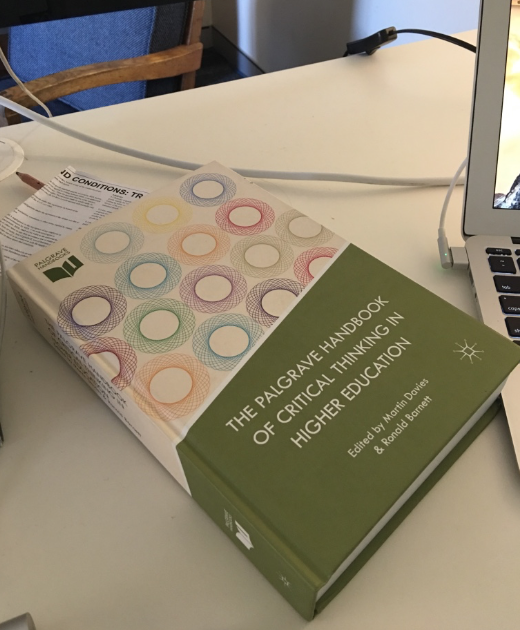 The Palgrave handbook of critical thinking in higher education is an excellent book for someone like me, but I don’t think it has a place on a thesis writer’s shelf, unless you happen to be writing a thesis about critical thinking of course! It’s the kind of book aimed at libraries and I hope many buy it. « What is your thesis totem? The perception of a conflict of interest is not the same as actually having a conflict of interest. I think they are completely different things. A future blog devoted to unpicking the topic of “conflict of interest” might be worth looking at. Particularly from the critical thinking point of view! Thank you for this. As I set out on the road to my PhD, these questions of criticality and creativity are at the forefront. Can you give the ref to the Hannah Arendt quote please? I would like to follow up on it. Thanks for the wonderful post! Is there more info about the findings from the PhD student blogging? I am very interested in learning more about it. I started to blog about my graduate student activities/ interests during my MA in 2013, and then transitioned into a PhD program. I use the blog as a place to write about what I am doing with wool/ alpaca/ mohair, and it loosely links back to my PhD topic on local fibers for clothing and textiles. I found it’s a helpful way to stay connected with fiber farmers and artisans. I loved this collection of perspectives on critical thinking. And I sympathise with the TBR pile. It mocks us! I never thought I get so much inspiration through your posts! I participated in your workshop tilted ‘writing that article in 7 days,’ and would like to access your powerpoint for that workshop. Thank you very much for this article, you really speak out What i had in my head, my fears as phd student ! Your blog is amazing please carry on this beautiful work !